Experience powerful Wi-Fi coverage throughout a very large house. Three simultaneous data streams on each band for faster performance. 1.8 GHz quad-core processor for extremely fast data transfer speeds. Automatic network prioritization on the two 5 GHz bands for optimized speed and performance. Unleash the potential of your home Wi-Fi and enjoy exceptional wireless speeds with the Linksys MAX-STREAM AC4000 MU-MIMO Wi-Fi Tri-Band Router (EA9300). Featuring Tri-Band technology, the MAX-STREAM AC4000 is ideal for households with heavy entertainment streaming and online gaming needs. Three dedicated Wi-Fi bands deliver combined speeds of up to 4.0 Gbps, offering enough speed for 4K video streaming, simultaneous online gaming, video conferencing, and other demanding tasks. Devices such as 4K TVs, HD streaming media players, tablets, and game consoles consume a lot of bandwidth. 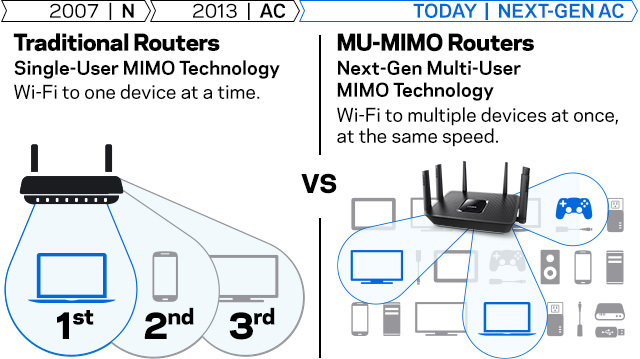 With MU-MIMO (Multi-User Multiple-Input Multiple-Output) technology, the EA9300 router sends Wi-Fi to multiple devices at the same time and same speed. It's like having a dedicated Wi-Fi router for each of your devices. Households with heavy Wi-Fi use will experience fast data transfers thanks to this gigabit Wi-Fi router's combined 4.0 Gbps speed and Quad-Core CPU. Each CPU core can handle a different task, greatly improving efficiency and overall performance. Linksys automatically pushes software updates to your router overnight and seamlessly brings the latest features and security to your home network. Your Linksys router will be consistently getting better over time. Improve your overall home Wi-Fi efficiency with the EA9300 thanks to Airtime Fairness, a feature that ensures even, fair distribution of Wi-Fi to different devices. This helps reduce the lag associated with slower Wi-Fi devices. Smart Connect feature balances your 5 GHz Wi-Fi connections and intelligently chooses the best radio band for your devices for the best Wi-Fi performance of your network. Some features that will soon be added to the EA9300 are Dual WAN Aggregation, DFS Channels Support, an OpenVPN Server, and Advanced Band Steering. Traditional routers and range extenders force you to manually connect to either the range extender or router's network in order to experience the best Wi-Fi signal as you move about your home. When paired with a MAX STREAM Range Extender, the EA9300's Seamless Roaming support allows your devices to automatically connect to the strongest Wi-Fi signal by utilizing a single network name. Then enjoy a strong, seamless Wi-Fi signal in every room of your house. Equipped with Advanced Beamforming technology, the EA9300 maximizes wireless performance by focusing its Wi-Fi signal directly to your device. This helps boost coverage and eliminate wireless dead zones in your house. This latest iteration of Beamforming supports both 2.4 and 5 GHz bands. Five Gigabit Ethernet ports let you connect more devices and share files 10x faster than with standard Ethernet. The two ultra-fast USB 3.0 ports are ideal for connecting shared network storage devices as well as a range of other peripherals. The EA9300 wireless router features six external adjustable antennas and nine high-powered amplifiers that provide six powerful simultaneous streams of data to your devices--ensuring complete coverage of your home. Better coverage means faster Internet speeds wherever you are. Guest Access: Create a separate password-protected Wi-Fi network for up to 50 guests and easily share the password. Parental Controls: Ensure a safe Internet experience for your kids--even when you're away from home. Restrict access to inappropriate or distracting content, control usage, and block specific devices from accessing the Internet. †The standard transmission rates—750 Mbps or 1625 Mbps (for 5 GHz), 750 Mbps (for 2.4 GHz), 54 Mbps, and 11 Mbps—are the physical data rates. Actual data throughput will be lower and may depend on the mix of wireless products used and external factors. **Seamless Roaming is designed for devices that support the 802.11k standard, including but not limited to, iPhone (4s and later), iPad Pro, iPad Air and later, iPad mini and later, iPad (3rd generation and later), iPod touch (5th generation and later), Samsung S4 (Android 4.2.2/4.4.2), Samsung S5 (Android 4.4.2), and Samsung S6 (Android 5.0.2). For more information on other supported devices, please check with your device manufacturer. Seamless Roaming may require the latest Max-Stream firmware. Please check the support page of your Max-Stream router for more details. Some devices may require additional wireless adapters or an Ethernet cable to connect to this router. Maximum performance derived from IEEE Standard 802.11 specifications. An 802.11ac adapter may be needed to achieve 11ac data rates. In order to achieve the best performance, router must be used with a compatible AC1625 wireless device.